Hey there folks. It is fantastic to see you guys here and all geared up for another trip through the aromatic universe of essential oils in search of Mother Nature’s very own offerings for healthy and happy living. Most of you know me already, but for those of you who don’t, I am Olivia and I am here to guide you on this journey. Since we are talking about aromatic extracts, I reckoned that it would only be fair to have a series on the ol’ snout and its woes. Now, most people think that nasal congestion is the worst thing that can happen to their schnozzles. Think again folks because that is just the pipes getting clogged. Imagine what happens when the pipes, the drains and just about the entire plumbing network gets choked. We are talking about major pressure here guys and it is exerted against the soft tissue of your face. I know, even the mental imagery of that is enough to evoke an “ouch” from most. So, without further preamble, I am going to introduce you to the malady of the day – Sinus Congestion. Actually, this is not a lone problem but one that goes around with an entourage of health issues. Plus, there is a lot of misconception about sinus congestion. Many believe that only those with actual obstructions like a bony growth or a deviated septum suffer from this problem. What Exactly Is Sinus Congestion? Sinuses are often described as empty or air-filled pockets in the skull. I believe this description makes people grossly downplay their role in the functioning of our bodies. I mean it is natural to assume that these empty pockets exist only because whoever/whatever (I am deliberately playing it neutral here) made us got bored and punched a few holes in the ol’ skull. Not really! Think of your sinuses as your body’s very own snot factory and voice resonance box. Without these cavities, we would all sound like Mickey Mouse and Donald Duck. That said, when it comes to snot, as long as the supply is according to the demand and no more, it performs several very important functions. The slimy, colorless and odorless liquid is a part of the natural mechanism that both filters and humidifies the air we breathe. The mucus (now that you know how useful the slime is, I am going to afford it the respect it deserves by using its biological name) is produced both by the lining of the sinus and the nose. What is made inside the sinus cavity is channeled into the nose and from there it goes to cover the insides of your nostrils as well as the throat, keeping the tissue in there nice and moist. 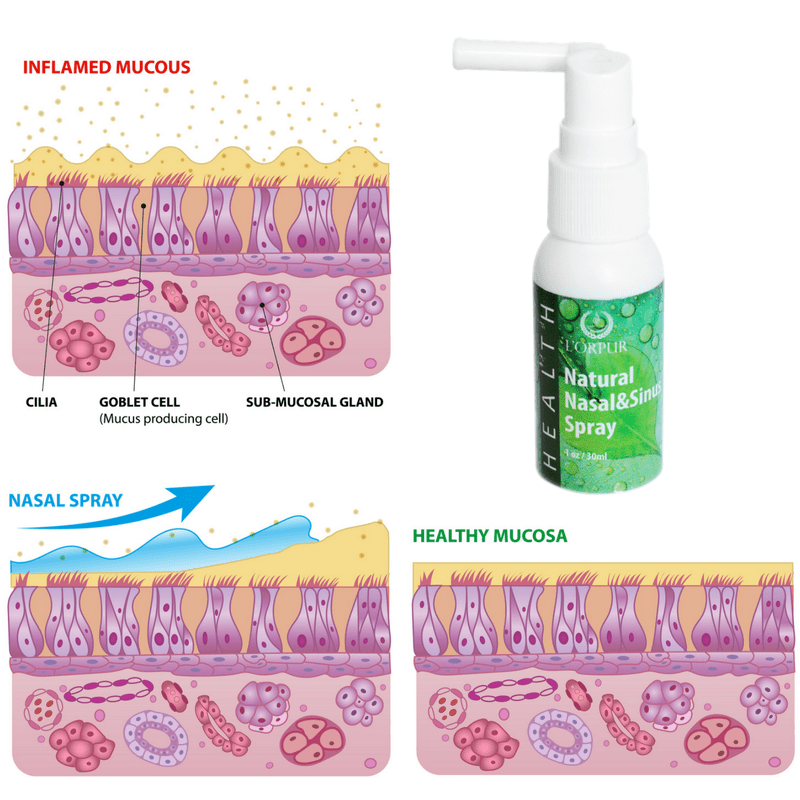 This whole process runs smoothly till something comes along and blocks the small channels or pathways that take the mucus from sinuses into the nostrils. The mucus production continues unabated, but with nowhere to go, the fluid builds up in these cavities. Now, the largest of these pockets are about an inch in size. So, as you can imagine, there isn’t a whole lot of space in there to hold the mucus if it begins to accumulate. As the amount of mucus builds, it exerts pressure against nearly all parts of your face, from the forehead to the inside of the nose and even the cheeks. And that is what we call a Sinus Congestion! What Causes Those Sinuses To Get All Clogged Up? Physical factors: Any abnormal tissue growth or bone structure in the nasal passage can create an obstruction and lead to both sinus and nasal congestion, nasal polyps as well as a deviated septum and even trauma injuries to the nose can eventually lead to the problem. Infections: The cause and effect equation is a bit muddled. Sometimes, the congestion happens first, which creates a rife environment for the bacteria, but in other cases, the infection starts first, which leads to the swelling of the mucus lining and the blockage. When it comes to the second scenario, the infection may very well start in the upper respiratory tract or even in the lungs and then travel to the sinus cavities, and it can be viral, fungal or bacterial. Allergies: Hay fever and allergic reactions to other environmental and chemical pollutants will often send the immune system into a tizzy, leading to inflammation and sinus congestion. Medical conditions: Asthma, as well as complications resulting from diseases that impact the immune system, like HIV, and disorders that affect the respiratory organs or even the esophageal tract in anyway, such as cystic fibrosis and gastroesophageal reflux can cause a blockage in the sinus cavities. Environmental factors: If the weather is hot and dry enough to cause dehydration, you can be sure that it will dry out the mucus lining or at least thicken the mucus. In both cases, sinus and nasal congestion are bound to follow. Similarly, smoke can often cause inflammation of the mucosa, particularly cigarette smoke. Medication: Aspirin sensitivity is also known to cause many respiratory issues, one of which is sinus congestion. When Should You See A Doctor For Your Sinus Congestion? If your sinus congestion refuses to go away or simply comes back after giving you a brief respite or if the blockage seems to be getting worse, you will need to see a doctor. Also, if the symptoms persist for more than 7 days or do not improve even after following the prescribed treatment, you will need a more thorough diagnosis. Moreover, if you experience one or more of the symptoms listed below along with what is normally thought to be an impact of blocked sinuses, you should seek the advice of an ENT (Ear, Nose and Throat) specialist. Signs of inflammation around the eyes (swelling and/or redness). How Does Modern Medicine Deal With Sinus Congestion? 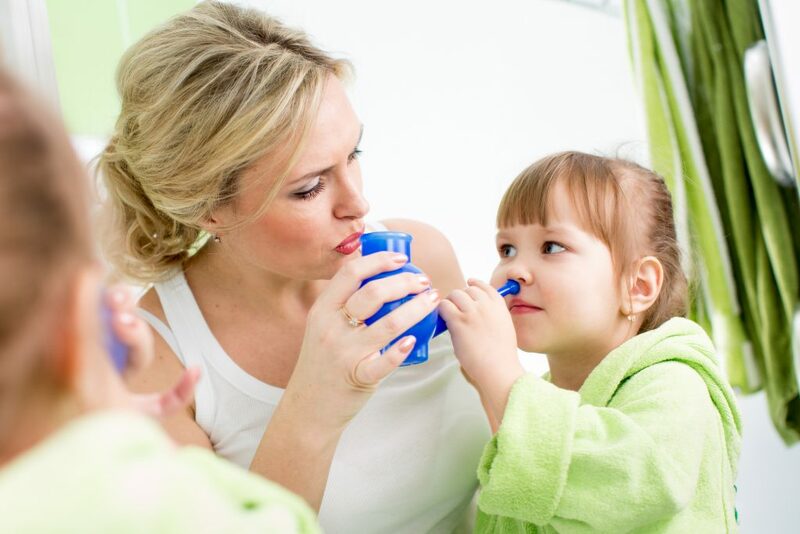 Nasal rinse: Saline irrigation is often used as the first line of treatment for sinus congestion because it rinses away allergens and reduces drainage. But often, nasal irrigation alone is not enough to bring the inflammation under control. Topical corticosteroids: Corticosteroid administered in the form of nasal drops or sprays are also used. Typically, you will be prescribed Nasonex, Flonase, Rhinocort, Beconase or other such products. When the drops alone are not effective, they are combined with saline water and used as a nasal rinse. Oral corticosteroids: For chronic and severe sinus congestion, oral corticosteroids remain the treatment option of choice. Particularly, if the congestion results from nasal polyps or other such physical factors, oral corticosteroids may be introduced in the treatment plan, when all else fails. It is crucial to understand that these meds do have serious side effects, so even doctors are wary of using them, unless absolutely required. Antibiotics: If the congestion is caused by or eventually leads to a bacterial infection, antibiotics will also be included in the treatment approach. Unfortunately, many doctors prescribe these even when they are not sure if the infection is viral, fungal or bacterial. Immunotherapy: If the sinus congestion tends to show up in summer or in response to exposure to a known allergen, you may be asked to take allergy shots. Aspirin sensitization: This treatment modality is only adopted when respiratory issues are caused due to aspirin allergy but the medication has to be taken to keep other health issues in check. Under medical supervision, large doses of aspirin are administered to increase tolerance to the drug. Do not try this at home folks; only a doctor can help you with this one. Surgery: When there is a physical obstruction in the nasal cavity or when soft tissue inflammation refuses to heed to other forms of treatment, an endoscopic surgery may be performed to remove the obstruction or inflamed tissue. In case of chronic sinus congestion, a procedure to enlarge the sinus drainage opening may also be considered. 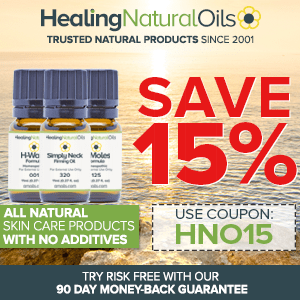 Why Use Essential Oils For Sinus Congestion? You may have noticed that even when you go to the doctor, the first order of the day is to deal with the thick snot and the inflammation, and they rely on warm salt water and anti-inflammatory drugs for this. Now, both inflammation and the thick mucus don’t stand a chance in front of the anti-inflammatory and healing effects of Essential oils. To add to the benefits, these volatile extracts have unrivalled powers to deal with infections of all kinds. Moreover, their ability to soothe and calm can tackle the ill effects of irritants with relative ease. The best part is that you can get the anti-inflammatory, antimicrobial, analgesic and expectorant benefits of these volatile oils simply by inhaling them. Add steam to the mix and you can give your tortured mucus lining a booster shot of hydration and healing all at once. In a nutshell, there is nothing your sinuses can dish out that cannot be handled with the help of EOs. If you want to know about the various ways to use essential oils for relief in sinus congestion, click here. If you are creating a list of EOs to deal with sinus congestion, it would not be complete without the inclusion of oregano oil in it. Yes, that is really how good this plant extract is. The combination of thymol and carvacrol create one of the most potent antibacterial and antifungal extracts in nature. 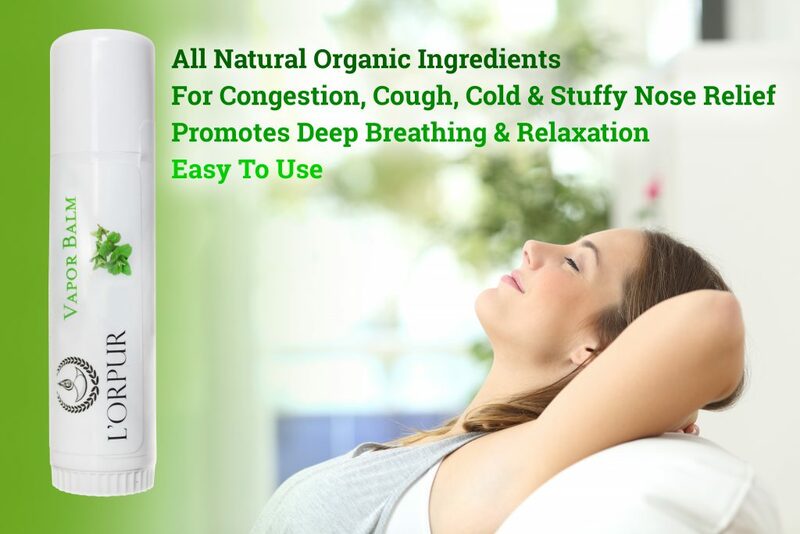 Add the ability to control allergic reactions to this medley of benefits and you will understand why oregano EO is considered one of the best natural substances for sinus congestion. Given the longstanding history of its use against nasal congestion, cough and cold it would be almost blasphemous to not include peppermint EO in my list. Menthol, which gives the oil its cooling effect, also works fantastically when used to clear mucus buildup. Moreover, the volatile extract has strong expectorant, analgesic, antimicrobial and antispasmodic properties. So be it nausea, a headache or a stuffy nose, this oil covers all the symptoms of sinus congestion. This oil is nature’s very own critter-killer. Because a sinus congestion will eventually lead to an infection or may even have been caused by one, rosemary EO will prove to be both prevention and treatment. If that is not enough, the warming properties of this oil will help to melt thick mucus while its ability to control inflammation tackles the swelling inside the respiratory tract. Basically, it’s a cure-all at least when it comes to sinus congestion. From vapor rubs to throat lozenges and from inhalers to cough syrup, this EO can be found in them all. So, I bet most of us have first-hand experience of the expectorant properties of the extract. Considered to be one of the most effective natural products for treating respiratory congestion and nasal inflammation, eucalyptus oil also boasts of antibacterial, antiviral and antifungal properties. For centuries, people in India have relied on these tiny seeds to rid them of respiratory congestion. 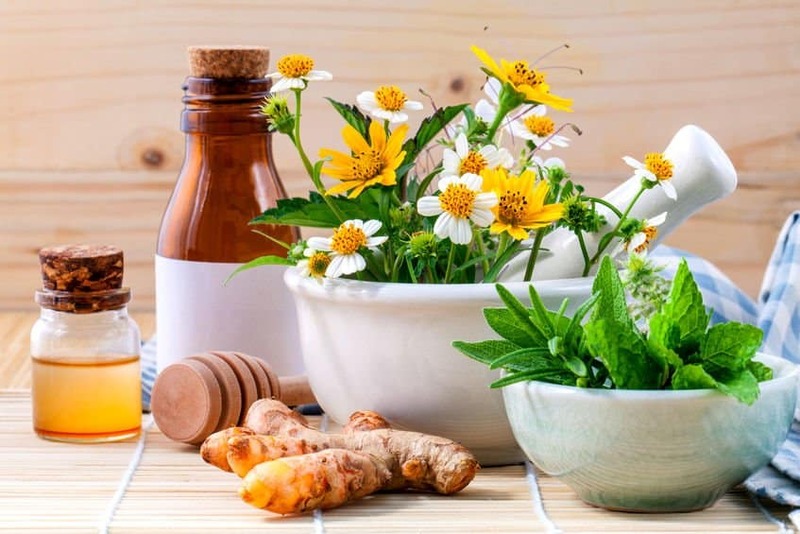 The oil extracted from them offers several times the expectorant benefits of the spice and is known to be particularly effective against chronic sinus and respiratory congestion. A potent tonic and stimulant, fennel EO not only regulates and improves the functioning of the immune and respiratory systems but also tackles fatigue, which is a hallmark of sinus congestion and infection. It is also anti-spasmodic in nature, which means it will tame the night time cough caused by sinus congestion. Do not use this oil if you are pregnant or trying to conceive. Another classic when it comes to fighting germs, tea tree EO is a warm and stimulating extract that builds your body’s ability to defend itself against microbial attacks, by stimulating the immune system. Moreover, there really is no critter out there that cannot be killed with this volatile oil. In fact, it is one of the few substances known to mankind that can defeat fungal, bacterial and viral infections along with the inflammation they cause. It also boasts of analgesic properties, which makes it perfect for use against sinus congestion. I personally prefer to use holy basil EO but it can be hard to find in the Western world. If you can’t get your hands on it, sweet basil EO is the next best thing. The list of benefits of this oil literally reads like a plan to combat all the symptoms of sinus congestion, not to mention that in Ayurveda, basil has long been used as the “go-to” herb for all respiratory problems. From influenza to common cold and from whopping cough and asthma to sinus congestion, this oil can treat them all and more. It is incredibly effective against the trifecta of infection, inflammation and pain, which is what gets most people down. As a bonus, the calming aroma of this oil also offers relief from stress and mental fatigue. If you are looking for a safe yet effective expectorant that can deal with all clogs of the respiratory system, reach for thyme EO. In fact, when antibiotics fail to help, try this volatile extract and you will be surprised at just how quickly it melts the plugs of mucus and phlegm. The oil is an excellent tonic and stimulant. 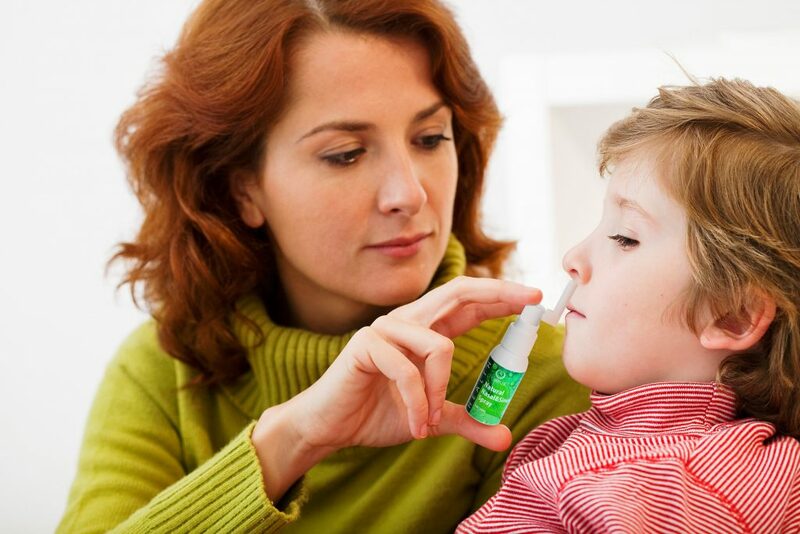 Additionally, the alpha pinene, caryophyllene and camphene in it boost the immune system and fight bacterial attacks. But my favorite property of this oil is its astounding ability to lift fatigue. 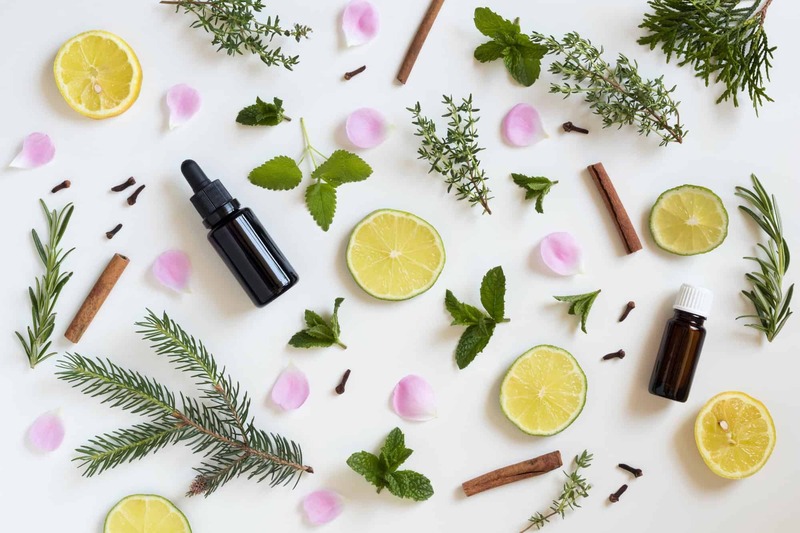 A mere whiff of this minty oil will leave you feeling energized and I assure you energy is something you will desperately need when dealing with congested sinuses. Apart from these oils, I will also be using the anti-inflammatory, soothing, analgesic and antibacterial properties of lavender, roman chamomile and lemon grass EOs. So, get ready to kick sinus congestion out of your life. 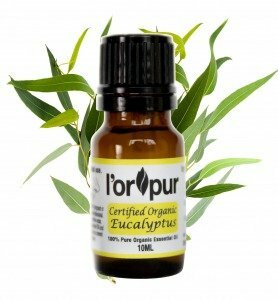 Before we kick off with the EO Recipes and Home Remedies, let me introduce you to L’orpur Natural Nasal & Sinus Spray. 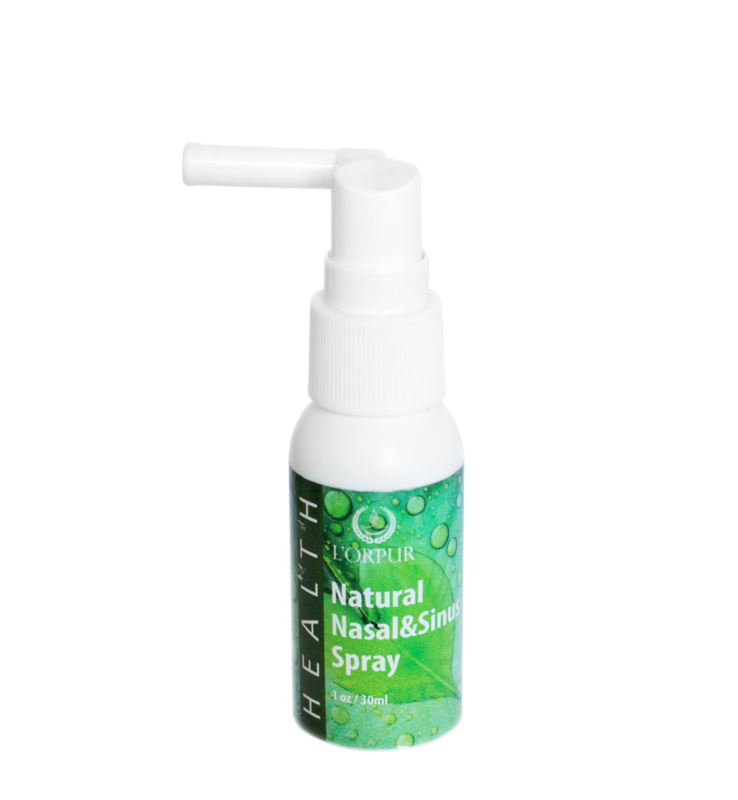 A safe, all-natural, multi-purpose, anti-bacterial and very effective spray for all types of sinus conditions including sinusitis; can also be used for chronic sinus conditions. Symptoms of sinusitis range from facial pain and headache pressure to nasal drainage, congestion and fatigue. It is easy to make this blend; you simply have to mix all the oils and store them in a dark colored glass bottle. You will need about 2-3 drops each time and you should use this blend twice a day. So, 30 ml will easily get you through a few weeks. To use, simply massage the neck, temples, forehead and breathe in the vapors. Mix and store the oils in a dark glass container away from direct sunlight and moisture. For steaming, you will need a large salad bowl filled with hot water, just a few degrees below boiling. Keep the level of water 2-3 inches below the brim. Add about 5-6 drops of the EO blend to the hot water and lower your head over the bowl, leaving about 10- 12 inches of space between the surface of the water and your face. Cover your head with a towel, making a tent with the fabric. This prevents the EO steam from escaping. As the water cools, you will need to move your face closer to the bowl but be careful because it will still be hot enough to burn. Keep your eyes closed and inhale as deeply as you can. If you feel that there is more congestion in the sinuses on one inside of your face or in one nostril, close the other nostril with your fingers and breathe deeply from the nostril on the congested side. The relief is almost immediate with this treatment, and 2-4 sessions is all it takes even to deal with stubborn mucus buildup. Melt the plant butter or the mixture of carrier oil and beeswax using a Pyrex beaker or a pint sized mason jar. Simply place the container in a cooking pot, filled with 3 inches of water, which should then be placed on the stove. Heat till the plant butter/beeswax melts. Stir the liquefied lipids till they combine. Then, remove from heat and add the EOs. Mix well and pour into a glass container. Allow it to cool before putting the lid of the container back on. Use as you would any vapor rub. For best results, apply on all the sore and affected parts like the forehead, the sides of the nose, throat and chest. Remember this is a strong mix and a little goes a long way. So, you shouldn’t slather it on like a lotion. Sounds too complex! No worries…you can have the ready-made version of the L’orpur Vapor Balm right here and as you would know by now, ALL our products ship for free irrespective of the price. Start with 2 salad bowls and 2 face wash cloths or handkerchiefs. Fill the first bowl with tap water and the second with hot water. You will be using the second for hot compress, so the water should feel hot to touch but should certainly not be boiling hot or even hot enough to cause burns on the skin of your face. You will soak the cloth in the water. As long as you can wring it without feeling the burn on your hands, you will be alright. Once you have the water filled bowls ready, take 5 drops of carrier oil in a tablespoon and add 4 drops of peppermint EO to it. Mix using a toothpick or a chopstick and pour this mixture into the bowl that contains hot water. Mix the remaining 5 drops of your carrier oil and the other EOs in the same way but use a clean spoon. Add this blend to the bowl containing tap water. Also throw in about 4-5 ice cubes in this bowl. The idea is to get the water nice and cold but not at freezing temperature. With the preparation taken care of, soak a handkerchief/facewash cloth in each bowl. Wring the one in the hot water bowl first and place it on your face, to cover the nose, forehead and at least the parts of your cheeks that are closest to your nose. Keep your eyes closed and allow the hot compress to act on your abused sinuses for about 3 minutes. You may have to dip the cloth in the hot water solution more than once to clock 3 minutes. Take the cloth off your face and put it back in the hot water bowl. Next, wring the cloth that was soaked in the cold water. Place it on your face in the exact same position to cover all your sinus cavities. This one stays on your face for 30 second. Repeat 3-4 times. Do this twice a day, and your sinuses will learn to behave themselves. This is a treatment that works for both acute and chronic sinus congestion and even when infection has stepped into the picture. Mix the EOs with the tablespoon of milk so there is no risk of neat oils coming in contact with your skin. Run a hot bath and add the salt to the water. Pour in the milk and EO blend, once the tub is 2/3rd full, right below the flow of water so that the oils get dispersed. Agitate the water once the bath tub is full. Soak yourself in the soothing bath for 20-30 minutes. 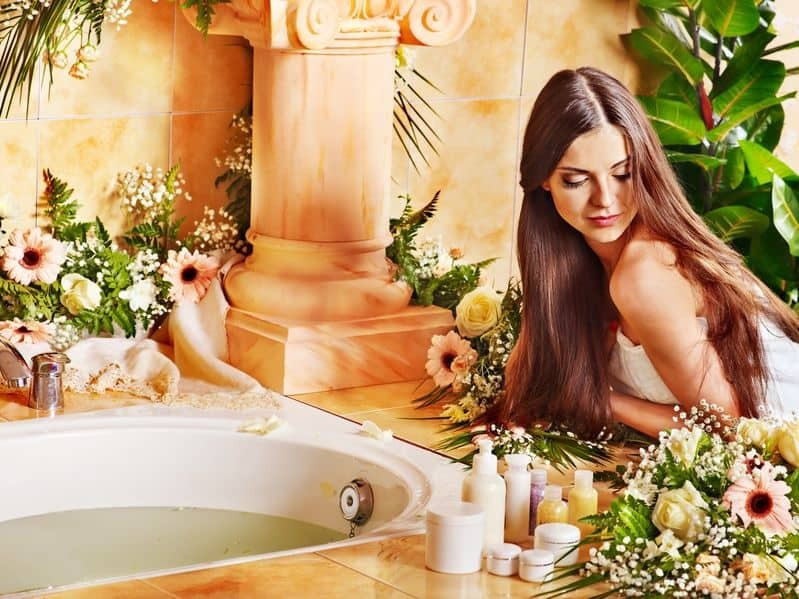 Lie low in the tub in a way that your body is immersed in the water up to your chin. The soothing warmth on your neck will help to prevent cough and throat irritations due to sinus congestion and you will get to breathe the steam in more deeply. First, mix the EOs and store in a dark glass bottle. After this point, there are 2 ways to go about this process. You can either premix the oils with fine ground sea salt/Himalayan pink salt or you can add the blend to the neti pot solution as and when required. Once you have mixed the oils, shift your focus to the salt. You will need it fine ground, so use your coffee/spice mill at its finest setting. If you would like to premix the salt and the EOs, remove the salt into a bowl that is large enough to allow mixing, without spillage. Now, here comes the hard part. You will need to pour the EO blend into the salt, literally, one drop at a time. So, pour one drop and then mix thoroughly. Repeat till you are done with all 15 drops of the blend. Store the mixture in a dark glass jar away from heat, moisture and sunlight. When you need to use the neti pot salt, remove using a dry spoon. If you want to mix the blend on the spot, heat about 2 tablespoons of distilled or pre-boiled water. Add a single drop of the premixed EO blend in the 2 tablespoons of hot water. To prepare the netipot, add a pinch of the EO-treated or untreated salt to the pot. Fill it with luke warm water (use pre-boiled or distilled water) and then add the EO mixed water to the pot. Use a wooden spoon or chopstick to stir the solution and use the netipot or nasal rinse pot as you normally would. Mix the EOs and store in a dark glass bottle. Once again for this recipe, we will only use 2 drops of the EO blend. No, you don’t have to discard the rest. Instead, use it for steaming but don’t use the blend topically and for steaming at the same time or even on the same day. Add 2 drops of the EO blend to 30 ml of castor oil. This mixture will also have to be stored in a glass bottle, and despite the high rate of dilution, I would still recommend that you go for a dark glass container. If you can see your nasal polyps by pushing your nostrils up/aside, use a Q-tip to apply the castor oil blend directly on the growth. If they are deep inside the nasal cavity, apply a drop of the blend in each nostril. Breathe in deeply, so that even those polyps that are far up in the nasal cavity get covered with the anti-inflammatory blend. Continue this treatment once a day for a week. Assess and restart if required. Give your body the time and nutrition it needs to heal. Your body spends a lot of energy to fight off an external invader. Plus, the ensuing battle leads to the production of toxins. The combination of energy expenditure and toxins causes fatigue and a general sense of malaise. The best way to combat the lack of energy and physical and mental stress is to eat healthy. Pick lean proteins, Omega 3 rich sea food, fresh green and colorful veggies and fruits to replenish your body’s defense mechanism. Along with proper nutrition, your body also needs rest to fend off the ailment and the inflammation. When suffering from a sinus congestion, use two pillows instead of one, which will elevate your head above the level of your neck and body and encourage mucus drainage. Also, use a diffuser in your bedroom. This will provide some much needed hydration to the mucosa and will help to melt the snot plugs. Nothing warms the cockles of your heart like yummy chicken soup (tomato soup will work just as well for vegans). Don’t forget to make it a spicy broth by adding ½ tsp of cayenne pepper, some sage, oregano and parsley for flavor. If you are not particularly fond of the pungent taste of cayenne pepper, go slightly heavy on your black pepper usage and the soup will still yield rave results. The deal with spicy food is that it causes watery nasal discharge. Now, this may seem like a counterproductive strategy when you were done in by too much mucus production to begin with. However, the watery nasal discharge actually helps to melt the accumulated mucus and in effect facilitates drainage. 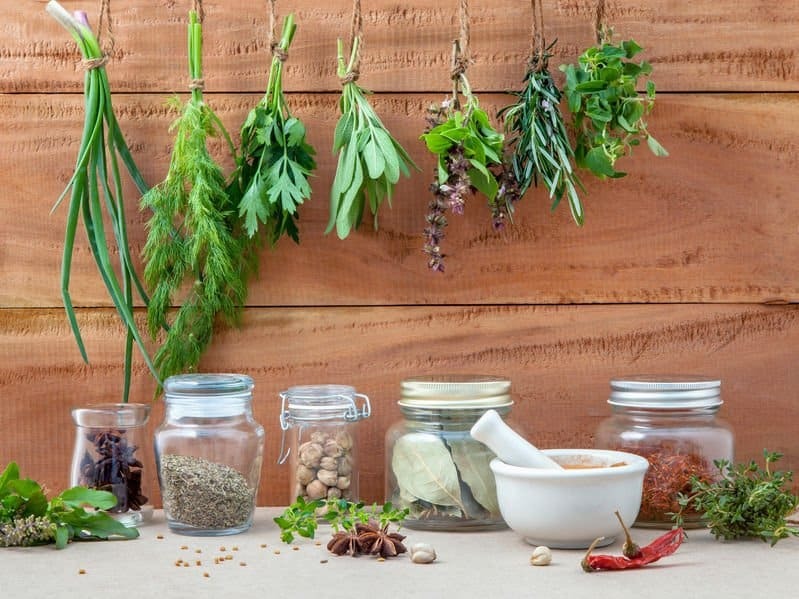 Also the warming effect of the spices, along with their anti-inflammatory and anti-microbial properties, helps to prevent and treat infections. In simple words, the spicy broth pretty much works like a pain balm on the inside. If any of you have ever made the mistake of swallowing more than a tiny amount of the white or green sauce that is served with sushi, you already have first-hand knowledge of what horseradish can do to and for your nose. For those of you who have not had a taste of the famed wasabi ever, let me tell you that it feels like an electric bolt that hits you squarely in the nose. But, this pungent property can come in handy when you are dealing with clogged up sinuses. Mix less than ¼ tsp of the Japanese horseradish sauce or ¼ teaspoon of fresh grated horse radish with ¼ tsp lemon juice and ½ tsp raw honey. Place this mixture on your tongue and hold it there for as long as you can without actually swallowing it. Once the extreme pungent zing evaporates (you are at this stage when the watering of the eyes and the heat in the nose subsides), you can either swallow the mixture or spit it out. I recommend that you swallow it because all 3 ingredients also work exceptionally well when consumed. This isn’t any odd tea I am talking about but a recipe that has been tried and tested over centuries in India. 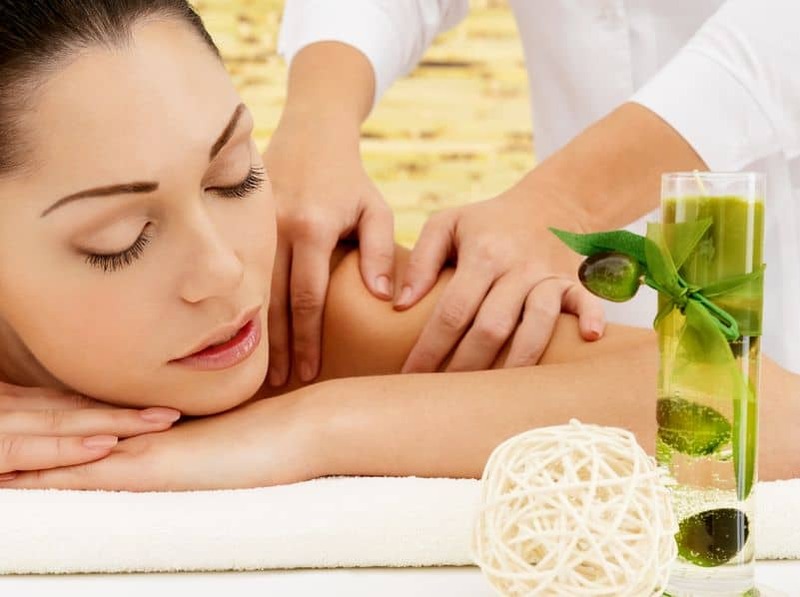 In fact, it comes highly recommended in several publications on Ayurvedic home treatments. Basically, it is ginger-lemon tea with a few more ingredients added for good measure. You will need 1.5 cups of water, a tsp of grated or minced ginger root, ½ tsp lemon rind (you can use a drop of food grade lemon EO) and 1 tsp chopped lemon grass. If you don’t want to bother with the chopping, simply cut out a few blades tie and throw into the tea water. Bring to a boil and then let steep till you get to 1 cup. Strain and add raw manuka honey to taste. Enjoy both the taste and the soothing aroma of the concoction. Mullein tea with ginger and honey added to it will prove to be just as effective. Vitamin C (1,000 mg, twice a day), will help against both inflammation and infection but it can be hard on the tummy. Also, echinacea, astragalus root powder and elderberry syrup can help to tame the thickened mucus and the inflamed mucosa. But as always, talk to your doctor before using herbs or supplements if you suffer from any underlying health conditions. If you suffer from chronic or recurrent sinus congestion, staying away from allergens is the simplest way to nip the problem in the bud. For instance, stay indoors in the high pollen hours of morning. Similarly, do not expose yourself to mold, exhaust, smoke of any kind and cigarette fumes. Using a HEPA filter and vacuuming your home often are other ways to prevent sinus issues. Sinus congestion does not have to rule your life, particularly now that you know how to prevent and treat the blockage. Remember, this is a condition that is best dealt with sooner than later. At the very first sneeze, use the EO recipes above to prevent a full-blown clog or you can try the L’orpur Natural Nasal & Sinus Spray. I will be the first to accept that a visit to the doctor is warranted even if the health problem is seemingly trivial but it keeps coming back. But, I am also strongly against the indiscriminate use of prescription meds and antibiotics. However, just remember that chronic sinusitis can take two to three months to get treated with natural remedies. A sinus congestion will not kill you, but by using a lot of antibacterial drugs, you are basically creating the perfect environment in your body for the rise of a monster bacteria that cannot be killed with any known antibiotic. The biggest irony is that antibiotics do not help at all against congestion nor can they fight off viral and fungal strains. So, what is the point? Play it safe for both today and tomorrow by taking the natural route. And on that note, here is wishing you all sneeze, cough and cold free days for years to come. Geez, sinus infection is a very irritating problem. There are over the counter remedies but the side effects are scary. Great there’s these given natural home remedies. Another informative post. I knew peppermint EO will be among the essential oil since it very good with congestion. Sure, I’ll have a post dedicated to sinus headaches in the coming weeks. Everything you write about interests me. Another outstanding article! Keep up the good work. Your articles may just be the best on the internet. You school us all very well. Thank you very much for reading and commenting on the various posts. It’s much appreciated and very encouraging. Outstanding info, ordered and can’t wait to try the lorpur spray for my acute sinusitis. You’re welcome and thanks for trying out the L’orpur Natural Nasal and Sinus Spray.